Heavy rain Wednesday. 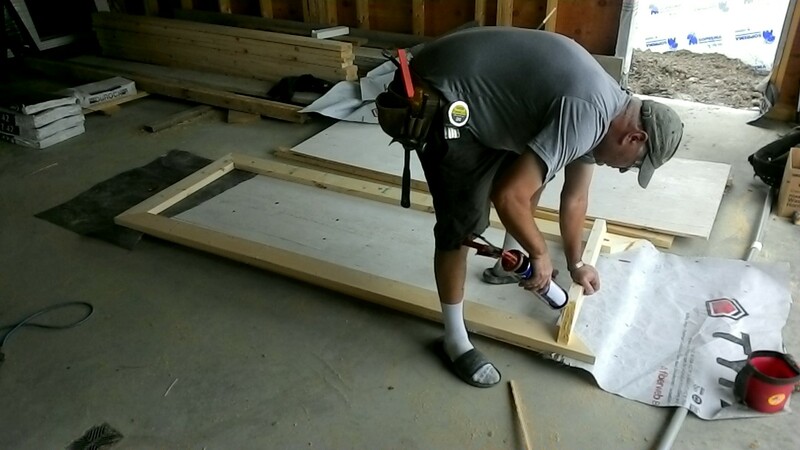 We found some indoor tasks to keep us busy, mainly building our own double doors for the Barn’s rear entrance. Each door consists of a plywood rectangle, cut to size, and a decorative frame made of 2×6 lumber. For the diagonal part of the frame we used a pocket jig to hide the screw holes, and the outer part is glued and screwed from the top and bottom edges where they’re the least visible. Pretty cool that we have all the equipment we need to build something you would normally buy at a store without a second thought. We also built a table behind the stairs for extra storage, and we finished the interior wall plywood. 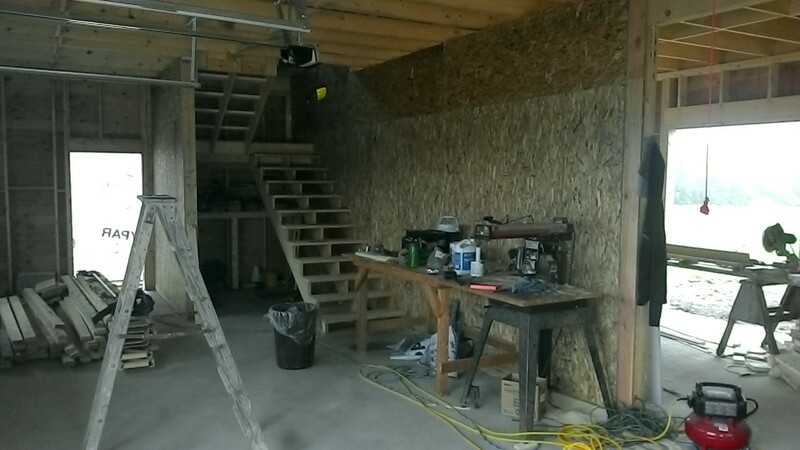 The interior wall plywood is complete; storage table tucked behind the stairs. 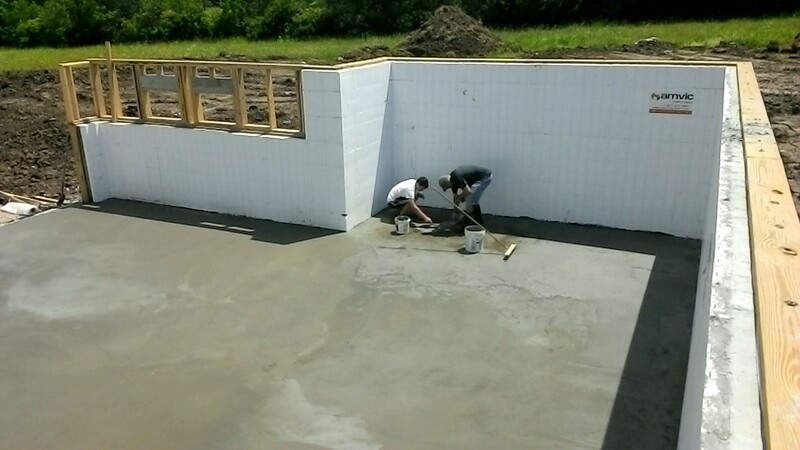 Thursday the weather improved and we ordered 17 cubic yards of concrete for the basement slab. This time Terry opted to skip the hired help and coached Colin, Carson, and me on how to spread the concrete ourselves. We all arrived on site with high-cuffed rubber boots. Before the pump truck and the first mixer arrived, we laid out plastic sheeting and pounded leveling stakes (just scrap pieces of rebar) into the foam. Colin set up the transit, which we used to survey the top-of-stake elevations and adjust them to be even. To our dismay, the foam and gravel had apparently settled in the rain giving us a 5-inch slab in many places rather than the 4 inches we wanted. No problem for strength, actually advantageous, but we knew we’d have to order extra concrete which cost time and money. 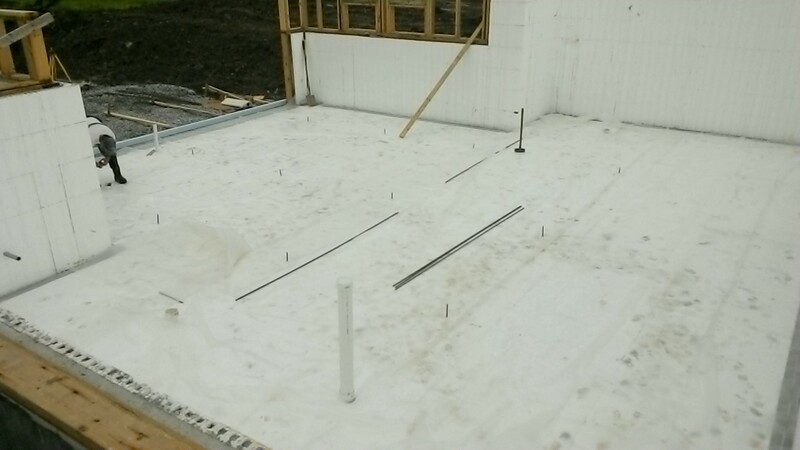 Plastic sheeting and grading stakes laid out… ready to pour! 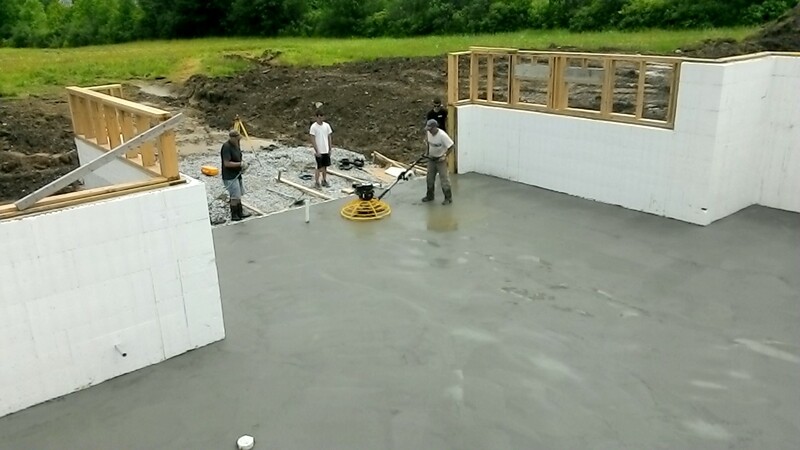 Colin swung the pump truck hose, Terry leveled the fresh concrete with a screeding bar, and Carson and I used rakes and trowels to move the goop around and to smooth it down. Punishing work and no downtime for anybody. We kept hydrated and prayed the sun would stay behind clouds; for the most part it did. As we proceeded southeast to northwest, we dropped rebar – a double row under the interior basement wall, and single diagonal bars for crack control. When we’d exhausted the initial concrete order, I estimated the remaining volume and Terry called it in. Meanwhile, Colin stepped out and grabbed a float for Smoothing Stage 2. It’s kind of heartbreaking to ruin a nice concrete surface by walking through it, but we often had no choice, and of course we then had to smooth our bootprints too. The concrete set quickly, and we sprayed water to keep it workable. Terry operates the power troweler while Colin and Cole spray water. As Terry, Colin, and Cole handled the final mixer delivery, Carson and I drove to Richmond Home Supply to rent a power troweler for Smoothing Stage 3. It looks like a giant fan attached to a wagon handle, and the blades flatten the surface under them as they spin. Once we could walk atop the slab instead of through it, Terry operated the troweler while I sprayed more water as needed. Colin and Carson located the drains (not an easy task!) and scraped out concrete to slope down. Mechanical room drain FOUND… smoothing out the downslope. The troweler’s job complete, somebody etched MMXIV into the slab and we stood back to admire our work. Or more accurately, we sat back in the Barn and ate lunch in silence, sore and exhausted from working the concrete. Despite some imperfections and more than a few moments of frustration, I think everyone is proud of our major Do-It-Yourself success.